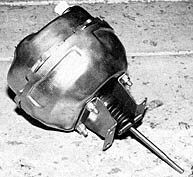 Upgrade Your 1960-1966 Chevy/GMC To Power Brakes In Only A Few Minutes! Improving your truck's braking system is an area that is one-hundred percent worthwhile as well as increasing the overall value of the truck. With the world of custom trucks taking off like wild fire a few years ago, more and more innovators entered the scene, bringing with them some really hot ideas, and some that are so easiIy incorporated, it makes you think you're a little behind for not thinking of it yourself. Take for instance, Classic Performance Products easy-to-install power brake kit. Nothing could be more simple while being such a major upgrade. 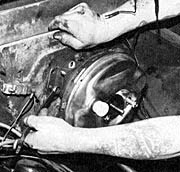 Think about it; most power brake upgrades usually come with a healthy instruction package and take much of a day, at least, to install. But, not this kit! We're talking 15 minutes and you're done! Okay, here's what you get. First, the entire kit comes assembled and ready to install including a power booster, custom mounting bracket, adjustable rod end and a brake pedal push rod. 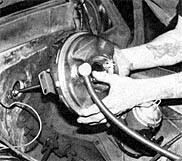 But, the best part of all is that you use your original master cylinder and you don't have to bleed the brakes. 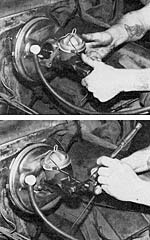 The setup is designed for 1960-'66 Chevy trucks with manual drum or disc brakes. When ordering this new power brake kit from Classic Performance Products, you must mention what type of brake system your truck has so that you can be dialed-in with the proper power booster. And for heavy duty applications, there is even a booster available to meet those requirements as well. So if your 1960-'66 Chevy truck is crying out for better binders, this is the kit for you. Like I said earlier, it is a quick and easy installation that any enthusiast can perform in his own garage. The new bolt-on power brake kit from Classic Performance Products comes completely assembled with a new booster, custom made mounting brackets, rod end adjuster and a brake pedal push rod. 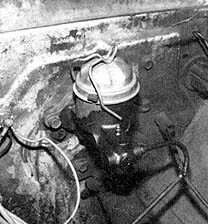 Here is what most 1962-'66 Chevy trucks with manual brakes will have, a single reservoir master cylinder hanging from the firewall. 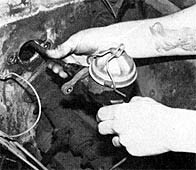 Begin by removing the stock master cylinder from the firewall. Do not remove the brake lines. 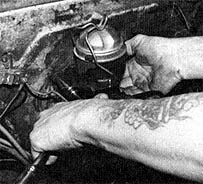 Simply position the master cylinder slightly away from the area in which you are working. 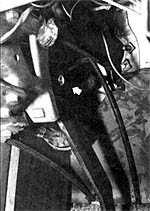 The stock push rod must be detached from the brake pedal to fully remove the stock unit. Now, slide the new power booster onto the firewall, lining up the bottom holes of the bracket with the two stock holes. Then mark the two upper holes of the mounting bracket to be drilled. 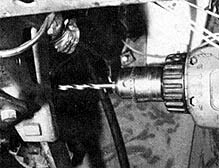 The firewall on these old trucks is very thick, so it's best to tap each hole mark with a center punch before drilling. Also, make sure that there are no obstructions such as loose wiring directly behind where you plan to drill. With the new holes drilled, the power booster is now permanently mounted. 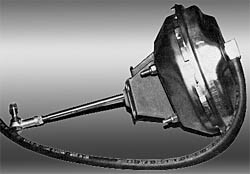 After the power booster is firmly mounted, the stock master cylinder can be installed. There are a variety of vacuum fittings on your engine, but the most optimum will be a manifold fitting for attaching the power booster hose. 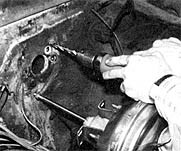 Mark and drill on the brake pedal arm where the rod end adjuster is to be attached while observing the action angle and clearance of the push rod. 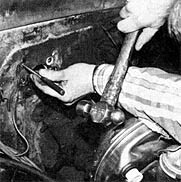 If everything check out okay, attach the push rod to the brake pedal arm and adjust accordingly. There you have it, a big boost to improve braking in only minutes. For heavy duty applications, Classic Performance Products offers a variety of master cylinders to meet your application.